More than 300 wild reindeer were killed by lightning in Hardangervidda, Norway. 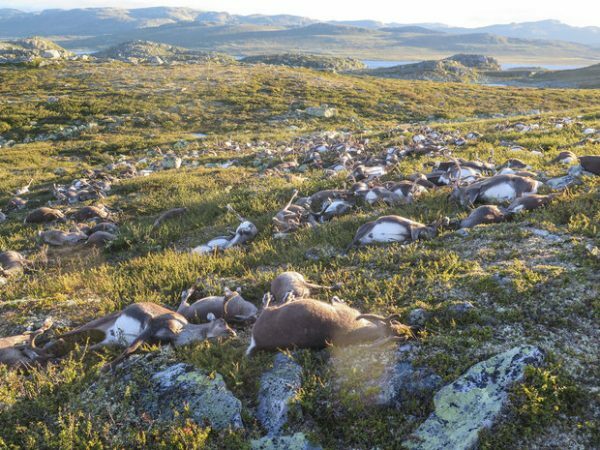 The 323 carcasses were found on the Hardangervidda mountain plateau after a lightning storm passed through on Friday, 26 August. The animals, which included 70 calves, were found within a radius of just 50 meters. An additional five other reindeer who were injured by the storm had to be put down. Although lightning is known to strike and kill animals, officials from the Norwegian Environment Agency have never seen this many animals killed before and are calling it a “freak accident”. An employee of the agency found the carcasses while conducting a count in connecting with the culling of the herd, through a controlled hunt. 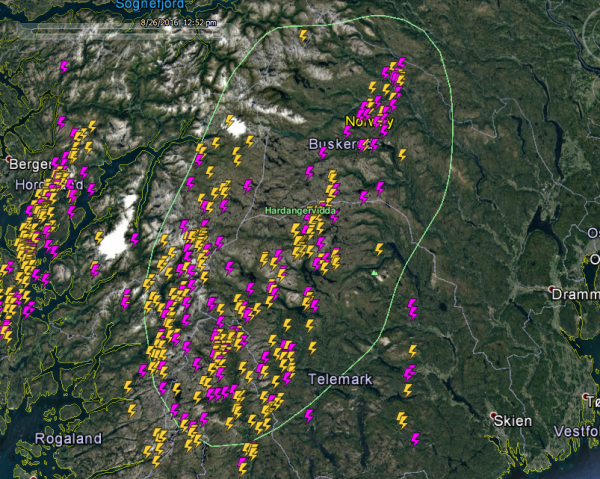 Earth Networks Total Lightning Network™ detected 511 total lightning strikes over central Norway on the day the animals were found. Instead of each reindeer being directly struck by a bolt, it is more likely that one cloud-to-ground or direct strike to one animal caused the death of all of the animals. It is believed that a high frequency of electrical discharge, detected by Earth Networks in the video below, and the interaction of the lightning with the earth and water had electrocuted the animals. The above video shows the path of the lightning strikes over a 12-hour period. The yellow bolts indicate cloud-to-ground strikes and the purple bolts represent in-cloud lightning strikes. Reindeer are herd animals and tend to stick together closely during thunderstorms or other stressful events. This strategy normally works to protect them, however in this case it may have led to their deaths. Much of the mountain plateau where the bodies were found is part of Hardangervidda National Park. The park is home to approximately 10,000 reindeer, making it Norway’s largest wild reindeer range.